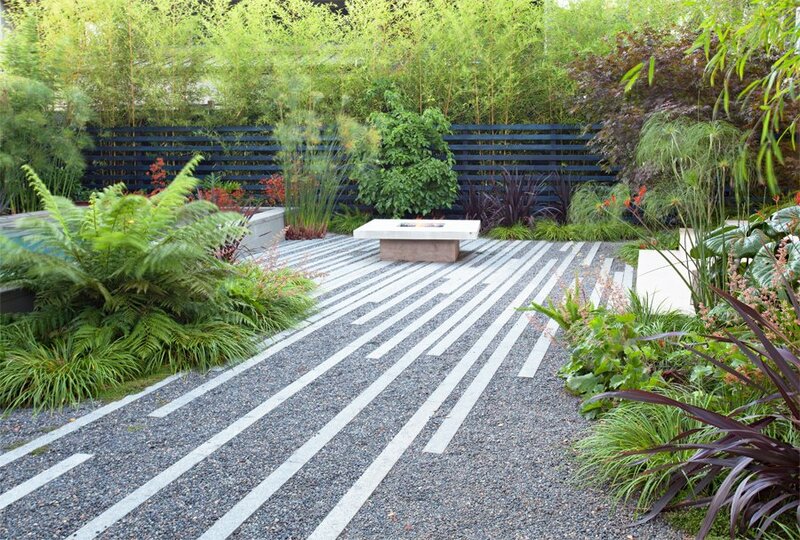 In these landscape designs by Bernard Trainor, strong lines in the garden work to direct the eye and create a sense of direction and flow. 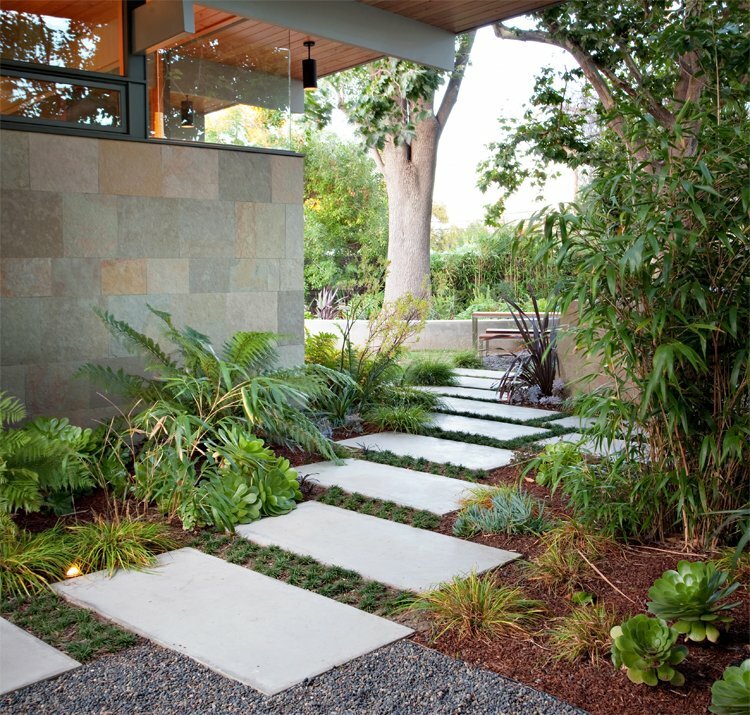 Contemporary landscape plans follow a grid, a pattern, or an organizational design and often take a design cue from Japanese modern, French modern, or mid-century modern design influences, updated with a color palette and plant choice. "Once a good plant palette is determined for the project, it is equally important to remember to keep the plant materials organized," Risner says. "The use of one material as a large swath or masse has more of a visual affect than a hodgepodge of a variety of plant materials. "It is important to look at the landscape architecture from the inside out when planning for the plant materials. Some areas may need height for screening or low materials to not obstruct views. The landscape architect also needs to look beyond the boundaries of the space and take in all the environmental conditions." It's impossible to open a garden magazine today and not be overwhelmed by the use of succulents. However, this isn't a new trend. The June 1954 cover of Sunset magazine featured a Royston-designed deck in Mill Valley that showcased a large dish planter made from a boiler end, a postwar surplus item, mounded with succulents. "Looking at it today, you would never know it was a 60-year-old photo," Miller says. "Succulents, drought tolerant grasses, natives—even though these might be exactly period-correct plant materials—they adapt well to the modern design style and are far greater at water conservation," Risner adds. In the postwar period, technology played an important role in landscape design, and the trend continues. "Twentieth-century America loved technology—and in the years following World War II, you begin to see technology making its way into the garden," Miller says. For example, swimming pools used to be only for the rich, because you needed someone available to closely maintain them, to keep the water clean and clear. But in the postwar, technological advances made it possible for so many more homeowners to afford a swimming pool. Also, rising middle-class salaries, less expensive construction techniques, and large suburban backyards allowed more families to install pools. Technology is also providing us water-wise irrigation that lets us put our plantings on automatic timers, and garden lighting that expands our ability to use the outdoor spaces well into the night without adding much to the cost of utilities. While homeowners will certainly benefit looking to history and established landscape techniques for cues on designing their patch of terra firma, they shouldn't let rules stifle creativity. Modern home landscape design is also a matter of personal taste and lifestyle; it is an art and a science that, when executed well, will add to homeowner enjoyment and home value.